Which fast-food fried chicken is the most delicious? 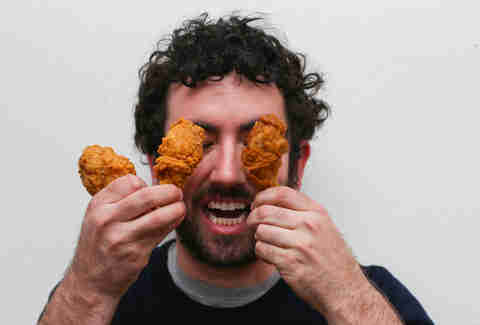 There're a ton of different styles of fried chicken, but the king of the coop is certainly the fast-food fried chicken. 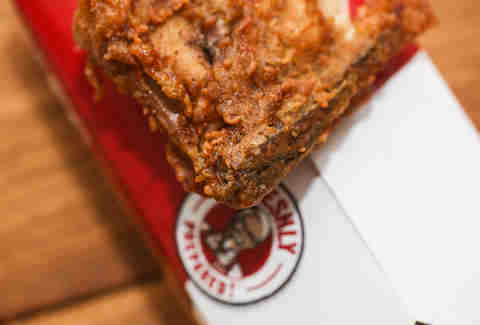 In an effort to help cross a few brands off your bucket list, we visited three fast-food chains (Church's, Popeyes, and KFC) and ordered an original recipe thigh, drumstick, and biscuit to be tested in the categories of breading, chicken quality, greasiness, and overall flavors. Bonus points were awarded for biscuit quality, and Church's free mashed potatoes served as a palate cleanser between bites. Only one laptop keyboard was permanently stained in the making of this taste-test. 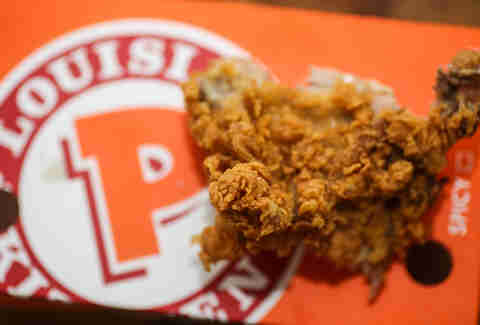 Breading: 4 - When you're eating fried chicken, you don't want to think of the word skin. But without substantial volume or crispiness, the barely-there salt bath of batter doesn't do the chicken any favors. Chicken: 2 - These are the biggest pieces of chicken out of the bunch, but not our favorite. Grease: 10 - You will need a napkin when you eat this. Overall flavors: 2 - Depending on how long it's been since you've had KFC, you might have a nostalgic yearning for the platonic ideal of fast-food fried chicken. It doesn't deliver. Biscuit bonus points: 1 - The chalkiness of the biscuit actually makes a natural pairing with the chicken. Breading: 10 - The word buttermilk actually seems appropriate here. The breading flakes off in big, thick chunks, whose hollowness is confounding. Chicken: 4 - The quality of the chicken is mid-grade at best. There's a bit of a foul (zing!) flavor to it that comes off as sweetness. Grease: 3 - The least greasy of the bunch, but it still makes me want a napkin just thinking about it. Overall flavor: 6 - Pretty solid. It definitely tastes like you're participating in cruel farming practices, but it also tastes delicious. Biscuit bonus points: 3 - This is essentially free dessert. It's doused in a sticky honey substance that makes it taste closer to cornbread. Final verdict: Worthy of praise. Breading: 8 - This is the crispiest exterior of the bunch and also the most substantial. Bite into a crunchy flake of fried excess, and experience true gluttony. Chicken: 8 - The meat is loaded with juice and has a strong savory flavor that doesn't taste like a factory farm at all. Grease: 6 - You're gonna need a napkin and also some face wash. 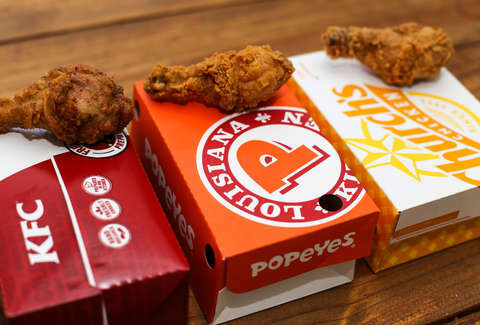 Overall flavors: 8 - Fried chicken is inherently a Southern thing, and Popeyes delivers a mumble-y Cajun flavor that makes you feel like you're in Louisiana. Biscuit bonus points: 2 - Strong resemblance to a hockey puck. Final verdict: Don't eat your spinach, eat this. The Colonel, who I remember fondly as a happy character from my childhood, does make me want to run and buy a new bolo tie, but his chicken isn't enough to make me go back. 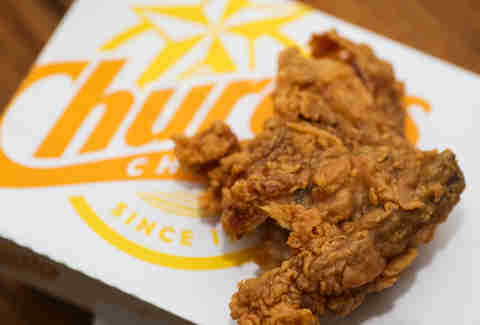 Church's succeeds in offering a tasty alternative, but underneath the thick cloud of crumbly batter hides fairly neutral flavored meat that tastes totally naked without the crunch of buttermilk. The true champion of the test is the mighty Popeyes, whose ultra-crispy exterior gives way to some of the most flavorful fowl to ever stain a paper bucket. Dan Gentile is a staff writer on Thrillist's National Food/Drink team who has taste-tested everything from the Big Mac to the Big King. He also enjoys hating mustard. Follow him to pots of gold/Twitter at @Dannosphere.